OKAGE-trained Teacher Consultants present at state, regional, and national conferences. These educators continually research and develop curriculum materials that incorporate state and national curriculum standards. Check out some of their great classroom materials on the Resources page of this website. "We can't imagine being the teachers we are without the support of OKAGE." Interested in learning more about being a Teacher Consultant? Click here to review Guidelines for Achieving National Geographic Society Certified Teacher Consultant Status, including benefits of TC status, the three steps to becoming a TC and a sample letter of intent! One of the benefits is password-protected access to the TC Resources page on this website. In addition, our TCs are available to train in local school districts for in-service days, one-on-one classroom consultation, small groups and district-wide meetings. 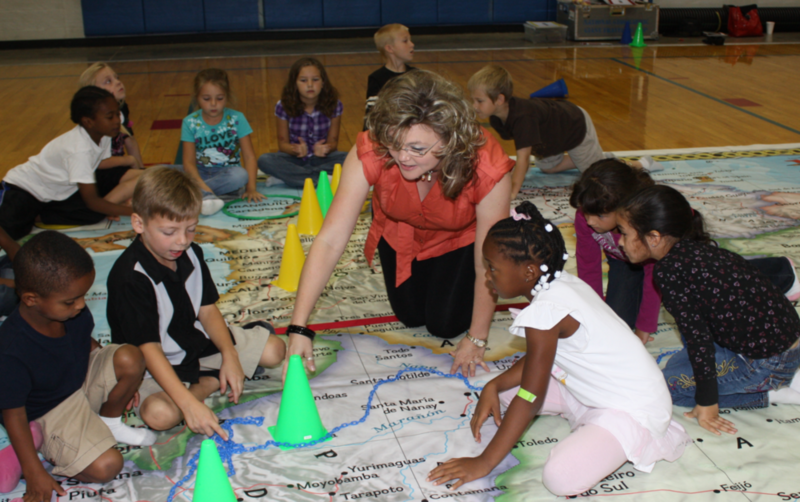 They also advocate for geography education and visit state officials to raise awareness about OKAGE programming and its value to developing well-informed citizens, quality curriculum resources, and enhancing the expertise of Oklahoma's classroom teachers. Questions? Send us a note using the Contact Us page on this website. If you have any photos of other OKAGE TCs that you would like to donate to OKAGE for inclusion in the Teacher Consultant Gallery, please contact the office. Margo Loflin, a teacher at Norman High School in Norman, Oklahoma, has been named the 2016 Oklahoma History Teacher of the Year, an award sponsored by the Gilder Lehrman Institute of American History. Started in 2004, the History Teacher of the Year Award highlights the crucial importance of history education by honoring exceptional American history teachers from elementary school through high school. The award honors one exceptional K-12 teacher from each state, the District of Columbia, Department of Defense schools and US territories. The National History Teacher of the Year will be selected from this list of state winners and honored at a ceremony in New York City. Past presenters at the ceremony include former First Lady Laura Bush, former US Secretary of Education Arne Duncan, the Honorable Sandra Day O'Connor, and former New York City Mayor Michael Bloomberg. In 1992 Margo Loflin completed her bachelor of science in education from the University of Oklahoma. She went on to become a National Board Certified teacher in Adolescent and Early Adult Social Studies Education. Margo has spent her teaching career in the Norman Public Schools system. She is the American History team leader, and teaches U.S. and AP U.S. History. Margo has served on numerous boards and committees, making time to also be an advisor for the Student Congress and Sophomore Class at Norman High School. She challenges students in the classroom, mentoring them in both school and life lessons. Ms. Loflin will receive a $1,000 honorarium and the Norman High School library will receive a core archive of history books and educational materials from the Gilder Lehrman Institute of American History. She will also receive an invitation to a 2017 Gilder Lehrman Teacher Seminar, a weeklong program that offers teachers daily discussions with eminent historians, visits to historic sites, and hands-on work with primary sources. The Oklahoma History Center is proud to partner with the Gilder Lehrman Institute for this program by providing qualified nominees and presenting the award to the state winner. Nominations can be made by a student, parent, colleague, supervisor or other administrator familiar with the teacher's work. To be considered for the 2017 award, teachers must be nominated by February 1, 2017. For more information, visit www.gilderlehrman.org/nhtoy. When I started my Ph.D. in the Department of Geography and Environmental Sustainability (DGES) at the University of Oklahoma (OU) in 2010, my mother handed me a story that she had saved of mine that I wrote for an assignment when I was in the fourth grade. The teacher wanted us to describe our favorite part of the school day. My first sentence was to the point: “My favorite part of the school day is leaving!” Twenty-years later, I still haven’t left! If someone would’ve told my parents then that their son would go on to get his Ph.D., I think they would’ve steered the conversation in a different direction. And if that wasn’t enough, to say that my subject of study would be geography, I can only imagine how their mouths would’ve dropped. That very story, however, provided important clues about my love for exploring landscapes and ultimate interest in geography—a subject/profession I didn’t know existed until I was 20-years old. I don’t recall ever taking a geography course during my K-12 years. In fact, I don’t even remember what class it was that I had to do the most basic geographic task of reading and identifying features on a map, though I distinctly remember my grandfather teaching me how to read his Rand McNally Motor Carriers Road Atlas and him having me navigate our summer road trips. In college, however, I wanted to learn how the Earth worked. And what better way to study the processes that make our home tick than enrolling in a World Regional Geography course? So, in the summer of 2006, I heeded my academic advisor’s advice and began my eight-week tour in a class at the University of Central Oklahoma taught by Doug Hurt, who’s now at the University of Missouri. Doug had just returned from Peru, and on the first day of his class, I can remember him showing us photographs of his trip. My immediate thought was: “this is what a geographer does?” Shortly after starting Doug’s course, I made an appointment to meet with him, thinking I wanted to switch my major to geography. It was after our meeting that I became a classic undergraduate student, changing my major a handful of times, from music to math education to social studies education, and then, ultimately, to a double major in geography and history. My love for exploring was finally being satisfied with courses that fueled my curiosity, including a newfound love in cartography and GIS. For instance, I had the opportunity to design two independent studies in which I examined the emerging Oklahoma wine and agritourism industry, and one that received undergraduate research funding for exploring the diffusion of coffeehouses in Mexico City. I also had the chance to take a field geography course to New Mexico and participate in a service learning project in El Cerrito—a tiny Hispano village located in the Pecos River Valley. There, I met Richard Nostrand, who to this day remains a mentor and close friend. My interest in designing maps led me to apply for and accept an internship as a GIS Specialist with the planning division of Urban Redevelopment at the City of Oklahoma City in 2008. Later that year, just before I completed my degrees, I prepared my application at the City to become an urban planner. There were no jobs, however. The Great Recession was in full swing. Doug encouraged me to pursue graduate school, so I began a master’s degree in history under his guidance, and the City allowed me to work as a part-time employee. During the first year of my master’s in 2009, I became a member of NCGE, and I attended and presented a paper at the annual meeting in San Juan, Puerto Rico. What a prime location for a first timer! On my flight there, I sat next to Kathy Davis, who’s part of the Arizona Geographic Alliance team. I quizzed her about NCGE and what the Alliance Network did for K-12 educators. Essentially, she sold me on becoming more involved in geography education. On the ground, I had the opportunity to network with several other educators, including folks who’re part of the Oklahoma Alliance for Geographic Education (OKAGE). Among them was OKAGE Program Coordinator, Gary Gress, who’s also an instructor in DGES at OU. I was 90-percent sure that I wanted to get my Ph.D. in geography when I landed in San Juan. After meeting and chatting with Gary, I became 100-percent sure. I also knew that I wanted to go to OU so that I could become involved with OKAGE. Luckily, the department accepted me with funding. And once I began my program, it didn’t take long for Gary to find me. Since 2010, I have been a part of several OKAGE programs, either as a geographer-in-residence, delivering content-specific lectures; as a field institute co-coordinator, designing field experiences and field guides; or as a workshop sponsor, facilitating opportunities for teachers to gain hands-on experience using geospatial technologies. Working with OKAGE and interacting with the dynamic K-20 teachers the alliance serves, has truly transformed how I teach my own courses and has made me dedicated to improving geo-literacy. I entered the tightening academic job market when I went ABD in 2013. I knew not having my Ph.D. in hand would be a check against me, and it was. I only received one call. It was for a GIS Librarian, tenure track position at OU that I applied for on a whim, but I received the offer. This is just one example of an alternative career path for a professional geographer in academia. But, as it turns out, the position is more than rewarding. Not only am I somewhat free to create the position as I go, I’m able to work closely with a variety of students, faculty, and staff, enriching their courses and research projects with geography and geospatial technology content and skills. Additionally, I have been able to design and maintain an active research agenda that explores effective ways to integrate GIS, geography, and sustainability into college courses. This includes projects on the value of interdisciplinary, team-teaching environments in sustainability focused geography courses, assessing students’ sustainability thinking and outcomes in geography courses, and integrating primary resources and archival literacy into GIS courses. Presently, I am working with colleagues on a project that examines the value of alliance-led field experiences for K-20 educators, and how those experiences resonate in their curriculum design. Indeed, I am a geography educator because I want to foster in students a zeal for discovering and learning about the intricacies of our world—themes I outlined were dear to me in that story I wrote in the fourth-grade. I now teach this diverse subject because I want to instill in the next generation the skillsets geographic education makes use of in analyzing the past, present, and potential conditions of our planet. 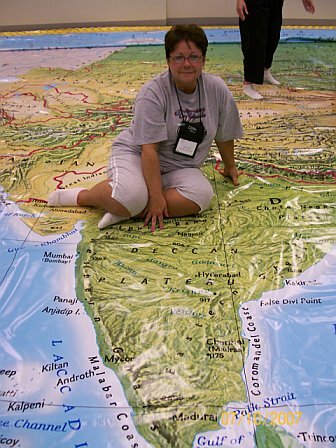 I certainly think geo-literacy can increase our understanding of human and physical systems that affect our home. I genuinely believe that this understanding will assist us in making prudent decisions to improve our environments and sustain them for posterity.